It started with a single piece of fish, or perhaps the trip that got me the fish. My husband had let me know that Montana Dan, our fishmonger at the Royal Oak Farmer’s Market, would be heading out for the fishing season, making this weekend his last at the market for the next couple of months. Clearly, we needed to stock up for us and our family. I got to the market later than usual and when I found Dan at his stall with only a single person in front of me, I jumped in line. It’s not something that happens often. He’s usually mobbed whenever I see him. The fish was out of its package and sitting on my counter defrosting and I had not a clue what to do with it. As seems to happen far more often than I care to admit, I went looking for inspiration in my cupboards and freezer when three things came tumbling out of the mess: a precariously balanced container of the last 1/4 cup of toasted walnuts from lunch earlier, a tub of spice mix from a medieval feast I’d cooked last year, and a stick of butter I was going to unwrap for the butter dish later. What’s even funnier is that they all fell into a pile of herbs I’d just trimmed back from the garden. Winter savory, to be exact, long in need of a trim to get it untangled from the rue that always takes over about this time of year. The hard part of baking this big of a piece of fish is keeping whatever is with it from burning. The fish needs to cook all the way through and the crust would delay it to some extent. As you can see from the picture above, I liberally sprayed the lime leaves with an olive oil cooking spray. And as you can see from the finished product at the top of this post, I should have probably covered the fish with foil part way through the cooking to keep the top of the nuts from scorching. Ultimately, a little careful scraping and the over-toasted nuts at the very top came off. We devoured it. There’s still a little piece of it in the fridge the next morning. You have no idea the self-restraint it took not to eat it last night even when we were stuffed to the gills (pun intended). It’s amazing I’m not in there now eating that little bit that’s left. And here I thought I wasn’t a fish person. Apparently all it takes is great ingredients. My hastily scribbled notes as I was coming up with ideas. Note that the ingredients don’t match the final product. Preheat the oven to 450F, with the top rack in the lowest third of the oven (furthest away from the heat). Sprayed a rimmed cooking sheet with light sheen of olive oil. Lay the fresh lime leaves on the cooking sheet and spray again with more oil. 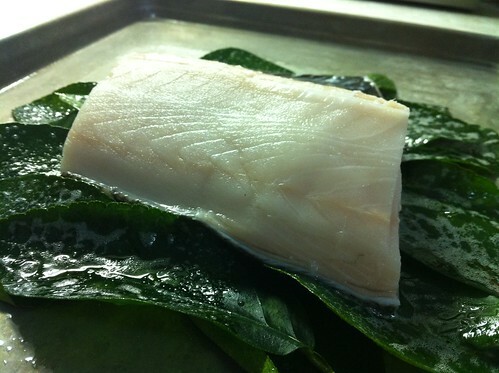 Pat the fish dry and lay it on the bed of leaves and set aside while the oven heats. In a food processor combine the walnuts, spices, oil, butter, green herbs (remove any woody stems), garlic, lime juice, honey, salt and pepper. Pulse until a thick paste forms and all ingredients are uniform in appearance. Remove the blade from the processor and stir in the breadcrumbs, making sure they’re distributed evenly. 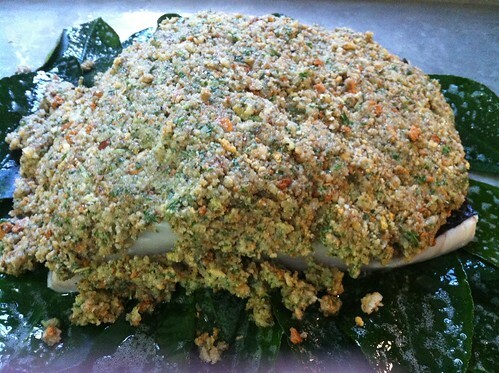 Scoop out the breadcrumb mixture and press it all in an even layer over the fish, completely covering the meat. Place the fish in the oven and bake for 12 minutes for every inch of thickness of fish, or until the center is opaque but still juicy. Remove from the oven and let stand for 5 minutes before cutting. I list the lime leaves as optional because I realize that not everyone has access to them. I like the delicate scent they give to any fish I use them on, though I almost always put them on the grill instead, so they end up with a bit of a smokey taste. At this high of a temperature in the oven the results were close but not quite the same. Still enjoyable, though. 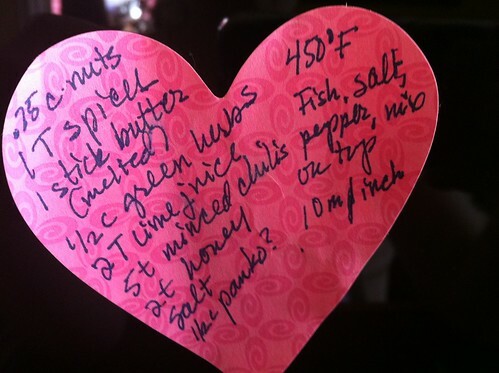 The spice mix I used was one I had on hand. It’s a blend of spices you might typically find in Middle Eastern cuisine, including cinnamon, cardamom, pepper, cumin, and a few other things. Pick a spice mix you enjoy using. I’d been trimming up the herbs in the garden prior to cooking, so winter savory was what I had on hand freshly. You could just as easily use parsley, basil, or cilantro (assuming you’re not in the no-cilantro-ever camp like my husband is). I don’t think herbs like sage would work as well. Rosemary might work with a bolder fish like salmon, but not as much with a delicate white fish. When it comes time to cook the fish, a good rule to follow is 10 minutes of cooking time at 450F for each 1 inch of thickness. With a crust of nuts and herbs like this, I found I had to up it to about 12 minutes per inch. I also should have tented some foil over the fish the last 5-10 minutes of cooking time. The nuts got a little more browned than I would have liked. 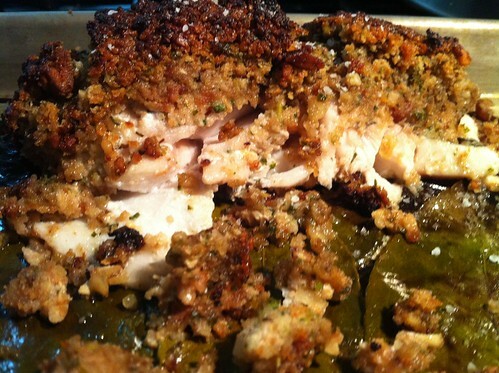 You are currently reading Recipe: Baked Whitefish in Walnut Herb Crust at More Than Just the Food.